A fascinating and stylish country home close to the village, with a range of flexible accommodation, a work shop and stables, on 5.5 acres with river frontage. This immaculate well maintained period home offers an inviting interior complimented by charming period features. It's nestled in one of the area's most sought after locations offering country living on the doorstep of the city. Combining classic details with sophisticated elegance and contemporary touches, this home offers an abundance of accommodation and living space in the 4,700sq.ft. over two floors, there is also a substantial converted attic ready for what ever you choose to use it for. This beautifully revamped home ticks every conceivable box for a luxury lifestyle, complete with superb outdoor appeal, the stables and paddocks are ready if you are an equestrian enthusiast. If hobby farming is your thing, the polytunnel is already there, with a small lake and a river also on the property, you’ll surely find something here to float your boat. 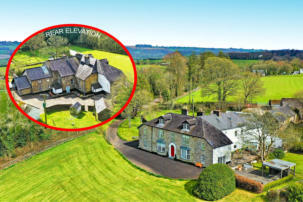 Along with the beautiful grounds and secluded setting this property is very convenient, it’s only 3km from Innishannon village - the gateway to West Cork and only 20 min. from Cork city and airport. Services: Private well, septic tank, oil fired central heating and broadband is available.